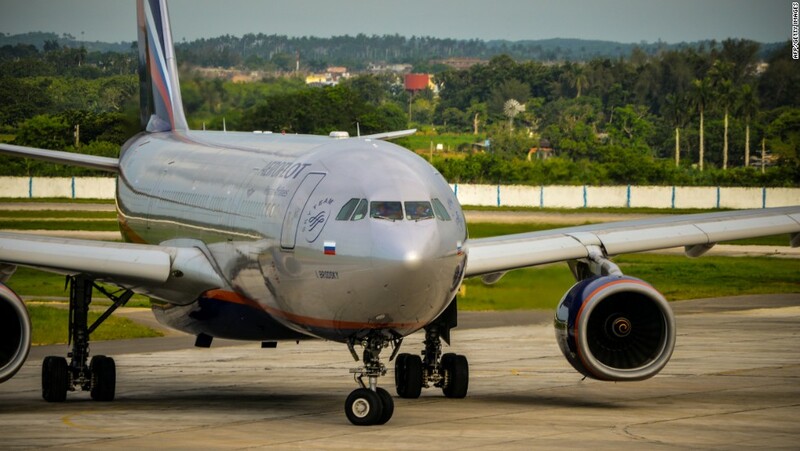 KIEV, Ukraine -- Ukraine banned Russian airlines from flying into the country in an effort to pressure Moscow over its backing of rebels in eastern Ukraine. Ukraine has decided to ban Russian airlines from its soil. During a meeting Friday, Cabinet ministers also prohibited transit flights of Russian airlines via Ukraine, "if they contain military goods, dual use or Russian military manpower," according to a statement by the government. "Russian aircraft with Russian tricolor have nothing to do in Ukrainian airports," Ukrainian Prime Minister Arseniy Yatsenyuk said at the meeting. The ban will include Russia's largest carrier, Aeroflot, and is set to take effect October 25. Moscow called the ban an act of "lunacy." "Suspension of air service between Russia and Ukraine would be another act of insanity," Kremlin Spokesman Dmitry Peskov was quoted as saying Friday by state media. "Looking back at the past 20 months, we cannot deny a hypothetical possibility of such acts of lunacy on the part of Kiev." Nearly 8,000 people have lost their lives as a result of the fighting in eastern Ukraine. Despite some isolated violations, Kiev and international monitors insist the ceasefire agreement between the military and separatists in the eastern part of the country is still holding. President Barack Obama and his Russian counterpart, Vladimir Putin, will meet during next week's gathering of the United Nations General Assembly, a senior administration official said. During their bilateral discussion, Obama will press Putin to deescalate tensions in eastern Ukraine where pro-Russian forces continue to clash with the Ukrainian military. The two leaders' relationship has soured since Moscow's annexation of Crimea from Ukraine, a military action that resulted in Russia's expulsion from the G8 group of world leaders. Putin has said there's no chance Crimea -- which Russia annexed last year -- will go back in Ukraine. Russia has denied widespread claims that it is supporting the pro-Russian separatists in Ukraine and has sent its own troops to the border.